The Blessed Virgin Mary, known in her litany as Queen of Peace, Mother of Mercy, Comfort of the Afflicted, among other titles, looks down upon the whole world from Heaven and sees the tremendous suffering and divisions of the human race. She is not indifferent to them but, through the power of Christ, helps to heal them and undo the world’s afflictions. It cannot be stated more emphatically that any work of grace accomplished by the Blessed Virgin Mary in her miracles and apparitions is due solely to the Passion, Death, and Resurrection of her Son, Jesus Christ. In union with Him at Calvary, she embraces all human sufferings and sees all men and women as her children regardless of the world’s problems and divisions. Within her maternal embrace she draws all men to Christ and, through His power, is capable of healing all the wounds of humanity – the worst of which is sin. The sinfulness of the human race is real and sometimes causes great harm. In his marvelous Apostolic Exhortation, Reconciliatio et Poenitentia (1983), Pope John Paul II offers a glimpse into the structural and social divisions that afflict humanity as a whole. Paragraphs 2 and 3 offer a bleak picture of “a shattered world” that is nonetheless “longing for reconciliation.” He lays out a very clear list of the many “painful social phenomena” that exist in the modern world: violations of basic human rights; destruction of freedom; various forms of discrimination, violence and terrorism; the scandalous international arms race; the unfair distribution of the world’s resources, among others. Thirty-five years later, we would have to add the proliferation of abortion and euthanasia, the terrible international drug trade, and the wicked human trafficking industries to this sad list. As a sword thrust at an enemy opens up a wound in the flesh, so do sins and the coordinated evils of sinful institutions open wounds in society and divide the “body politic” as we call it. Can Our Lady heal so much division in our world and untie the seemingly impossible knots of human suffering? Well, she has done so many times in human history already, and she can do so again whenever her children turn to her. 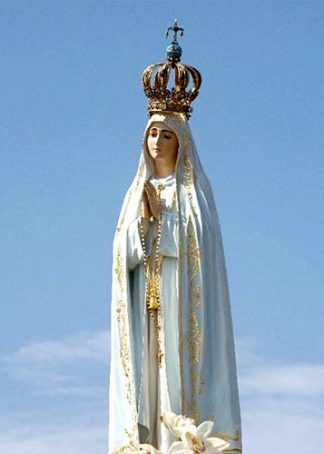 In the book, The Fatima Century, author Thomas McKenna recounts several astounding tales of grace accomplished by God through Our Lady in places where the famous Pilgrim Virgin Statue of Our Lady of Fatima has travelled in the last seventy years. For instance, there had been a terrible massacre and an ongoing sectarian war between Muslims and Hindus in the Northwestern region of India after the partitioning of that country in 1947. It was not a Christian conflict, but nevertheless a group from the Blue Army brought the Pilgrim Virgin Statue to India later that year, and on the day they arrived, a cease-fire between the warring factions was declared. Coincidence? Perhaps. Then, on the very day the pilgrims transported the statue to the border of the two countries on a flower-covered train, the two groups signed a lasting peace accord. It was not a statue that obtained that grace, but another force: the “woman clothed with the sun” (Revelation 12:1) who unties all knots of human problems when her children invite her into them. McKenna also tells the story of a man who had been imprisoned in a concentration camp for many years and whose entire family had died in Auschwitz. For forty years this poor man carried in his heart a deep-seated resentment of all the evils he had seen and personally experienced. When the Pilgrim Virgin Statue visited his parish in New York, he spent time in prayer before the statue and was completely liberated from decades of bitter hatred which was destroying him. Again, it was not a statue that healed him; it was Our Lady, who unties all knots [otherwise one might think that the statue represented her as the one on the image], who had been invited to that parish. To repeat the language of Pope John Paul II, we live in a “shattered world, longing for reconciliation,” but Our Lady delights in undoing all those knots of division and evil. Now that we are entering into a new year, let us make a prediction and a resolution: 2019 will be a special year of grace and favor for those who turn to the Mother of all mankind for the healing of their sins and problems. Just remember – she only goes where she is invited. Venez à Paris -Région Ile de France- confier vos soucis à Marie qui défait les nœuds!